Andrianov A. Biological defense of early potato from diseases in: Materials of international conference Biological plant defense as basis of agricultural ecosystem stabilization, p. 219-221, 2004, Krasnodar. Zlotnikov А.К. (2017) Albit - time-proved efficiency. Potato system. № 2. p. 28-29. Zlotnikov А.К. (2017) The world-famous biological product enters the market of Belarus. Our agriculture. № 9. p. 50-54. Albit shows positive results on potato, which is a high economic value crop in Russia. Albit is officially registered on potato as a plant growth regulator (Russian state registration № 081-07-866-1). Albit increases field germination capacity, accelerates plant growth and development, improves plant resistance to unfavorable conditions of the environment, and provides defense against plant diseases (such as black scurf, early and late blight diseases). Albit is proven to increase potato yield and to improve the quality of crops and tuber marketability. Albit is also registered on potato as a fungicide (Russian state registration № 1686-09-107-150-0-0-3-1). Albit provides defense against black scurf, early and late blight diseases. Albit is successfully used as an antidote to reduce toxic effect of pesticides. According to the results of field trials that have been conducted since 1999, Albit increases potato yield by 1.3-10 t/ha (3.43 t/ha or 20% over control on average). Albit treatment increased average potato yield in Bashkortostan, Voronezh oblast, Moscow oblast, and Stavropol kraj by 3.23, 2.86, 1.3, and 1.9 t/ha, respectively. Albit increases the germination capacity of tubers by 3-5%, stimulates early sprouting (from a few days up to one week earlier), accelerates maturing, and improves quality and marketability of potato yield (Figs. 1-5). Albit promotes earlier and more powerful development of potato tops and earlier tops dying-off with redistribution of nutrients from tops to tubers (Fig. 6). During field trials Albit decreased the infestation with black scurf (BE 50–68%), early blight (BE 31–59%), Macrosporium leaf spot (BE 60-70%), common scab (BE 30–69%), and late blight (BE 21-100% on tops and tubers). Fungicidal activity of Albit was detected at the disease prevalence of 3-79% and disease development of 1-29%. As for economic and biological efficiency, in field trials on potato the performance of Albit was similar to that of products containing thiram, oxadixyl, metiram, epibrassinolide, humic substances, triterpene acids, fir terpenoids, fludioxonil, carboxin, bacteria Bacillus subtilis, Pseudomonas fluorescens, and Pseudomonas aureofaciens. Apart from being tested at scientific and manufacturing trials, Albit is widely used in potato cultivation in Russia. Leading potato farms of Russia use Albit; amongst them are Meristemny’e kul’tury’ LLC of Stavropol kraj, Agricultural company Elitny’j kartofel’ of Moscow oblast, cooperative farm Odoevskie zori of Tula oblast, State Stem Farm “Verhnemulinskij” of Perm’ oblast, Experimental and Production farm of Transgaz “Pushkinskoe” in Nizhnij oblast, State Unitary Enterprise “Teplichnoe” of Mordovia Republic, Agroholding “Kornev Group” of Tambov oblast, “Kartofelny’j al’yans” LLC of Bryansk oblast, “Dobronravov Agro” of Bryansk oblast (the biggest potato-growing enterprise of the country), and others. Albit is very popular among owners of private farms all over the country: from Primorye kraj in the Far East to Kaliningrad oblast in the West. Albit treatment on potato includes pre-planting tuber treatment and foliar spraying during vegetative stage. Foliar spraying has the highest economic efficiency: 2 sprays during budding and crop cover stages, and further spraying with a 10-15 days’ interval. Spraying does not completely eradicate the effect of pathogens. However, Albit sprays immunize plants against late blight, if a plant is treated with Albit prior to appearance of any visible signs of the disease. Trials at Bashkir State Agrarian University showed that protective effect of Albit treatment against potato diseases lasts longer than the effect of common chemical fungicides and biological standards. When protective period of chemical fungicides ends, plants tend to become more susceptible to late blight than control plants. Albit treatment does not have this negative effect because it provides continuous and stable defense. Recommended application rate of Albit on potato for double spraying is 50 mL/ha (1-2 mL per 10 L of working solution). First spraying is conducted during budding and crop cover stages (BBCH 30-60), second – 10-15 days later, with the application rate of 300-400 L/ha. In conditions of active disease development the number of sprayings can be increased to four (with 10-15 days’ interval) to immunize plants, and sprayings can be alternated with treatment of fungicides with a direct action. Second and the following treatments with Albit can be carried out if early recommended sprayings were conducted. For plant immunization recommended Albit dosage against viral infections is 60 mL/ha (according to data Perm branch of Moscow State University). Commonly used solution on small plots is 2 mL of Albit per 10 L of water with the application rate of 3 L per 100 m2. Using both tuber treatment and double spraying on potato requires 450 mL of Albit per hectare. Therefore, one liter of Albit per season covers 2.2 hectares; every liter of Albit brings additional 7.6 t of potato yield. To achieve significant results, Albit treatments can be combined with insecticidal, herbicidal treatments. Albit is recommended to be used in combination with chemical fungicides (based on a.i. copper oxychloride + cymoxanil and copper oxychloride + oxadixyl). Treatment periods can be found in the recommendations for chemical fungicides. When chemical fungicides are combined with Albit, fungicide usage is reduced down to 50%. Some of the basic fungicidal treatments at early vegetative stages can be completely replaced by Albit (if Albit is used before any visible signs of diseases). Collective farm Odoevskie zori of Tula oblast used Albit in combination with halved doses of fungicides (2001-2004), which provided stable 100% defense against late blight and yield increase of 10 t/ha on average. Use of Albit had considerable savings of treatment costs, as compared to the full chemical standard defense system. insecticides against aphid and potato moth (a.i. dimethoat) on stock fields, where Albit effectively immunizes plants against viral diseases delivered by these insects, complementing the effect of the insecticides. Advanced farm consumers of Albit admit that only together with Albit pesticides can provide 100% of the effect declared by producer. 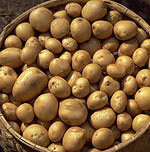 Each litre of Albit provides average yield increase of 7.6 tons of potato. 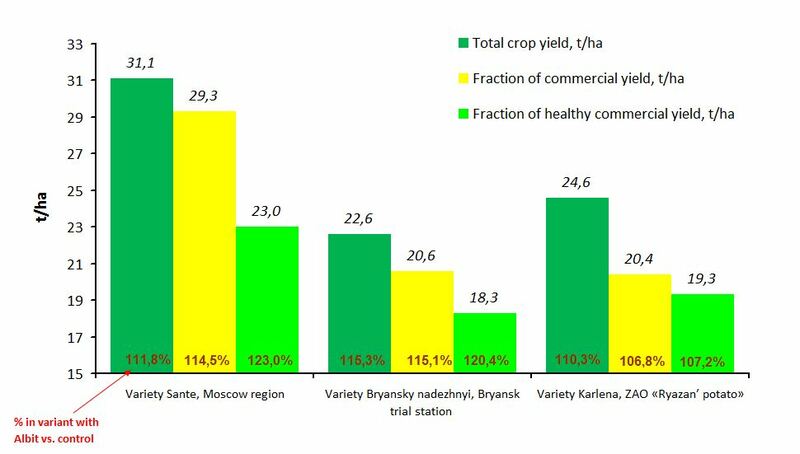 In variant with Albit a higher yield increase to control (in 2-3 times, with applied fertilizer “Kemira-universal” before field trial) was observed, than in variant without fertilizers (field trials of Bashkir State Agrarian University, 2001-2007). Fungicidal properties of Albit also increased in combination with “Kemira” (BE against late blight on tubers was 89.2-99.8% and 78.9% in variant without fertilizer). Standard fertilizers (manure + NPK) had not this effect. Synergism of Albit and chelating microfertilizer is observed in this case. An important aspect of use of Albit is its ecological compatibility. Albit is environmentally friendly and safe for human and animal health. Albit is safe to work with (class 4 of hazardous materials) and does not require particular means of precaution. Derived product is organic and ecologically clean. No waiting period. In the future, Albit can be used as an environmentally friendly alternative to pesticides in organic agriculture. Here are some examples of Albit trials on potato in Russian state scientific research institutes. During the research of All-Russian Research Institute of potato farming in 2006 on Golubizna potato variety, potato tubers were sprayed with Albit prior to planting. At the vegetative stage potato plants were cultivated four times, treated with herbicides against weeds, and with fungicides against diseases. Plant tops were removed eight days prior to harvest. Phytosanitary state of plants was evaluated three times during the vegetative period. Late blight disease on plant tops was present in 0.3-2.6% due to high temperature and fungicide use. Disease spread reached 30.5% in the end of vegetative period. Use of Albit reliably suppressed the development of late blight disease on potato tops. At the final evaluation, the number of plants affected by disease decreased 20-fold as compared to the control group. Disease development (R) decreased 13-fold. Biological efficiency of Albit against late blight disease was 92.3-100% (calculated based on R index). Albit treatment promoted the increase of potato yield up to 3.2 t/ha on average (with yield capacity of 12.5 t/ha in control). Amount of large potato fractions in fraction composition increased as well. Therefore, yield increase was determined by the increase in size of potato tubers and not their quantity. Analysis of potato tubers in yield affected by diseases demonstrated the evident of protective effect of Albit. Quantity of diseased tubers (i.e. tubers affected by a complex of diseases) decreased from 8.5% to 4.1% in variant with Albit. No sign of late blight disease was found in the treatment group; therefore, biological efficiency of Albit against late blight disease was 100%. Biological efficiency of Albit against black scurf was 46.2%, and 27.9% against Fusarium wilt. 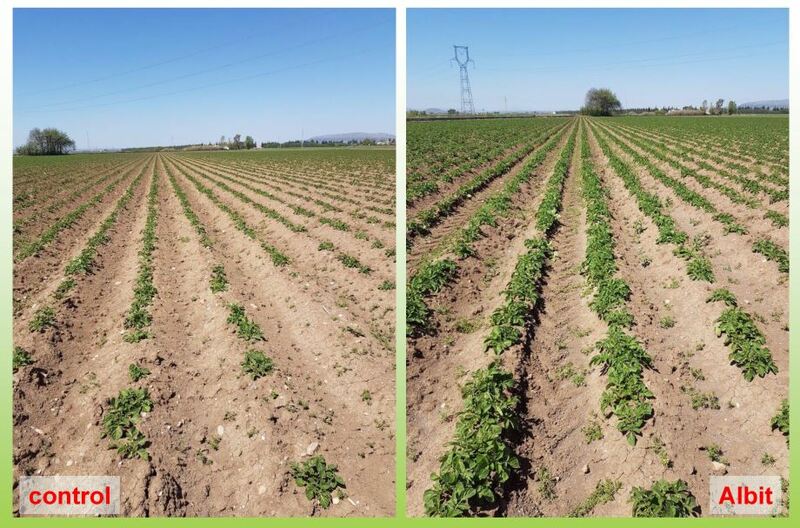 The conducted research found that treatment of potato tubers with Albit prior to planting can significantly decrease the disease damage during vegetative period (including the disease damage on yield), and significantly increase yield. Albit treatment before planting 100 g/t and two sprays of 50 g/ha during vegetative stage, at budding (crop cover) stage and 16 days later. Chemical standard: tuber treatment before planting with a product containing thiram (2.5 kg/t) and two sprays with a product containing oxadixyl and metiram (2.5 kg/ha) with 20 days interval. Observations of early vegetative stage demonstrated that potato tubers treated with Albit had increased field germination and plant stand density by 3.7% and 28%, respectively, and increased plant height by 3.4 cm as compared to the control group. 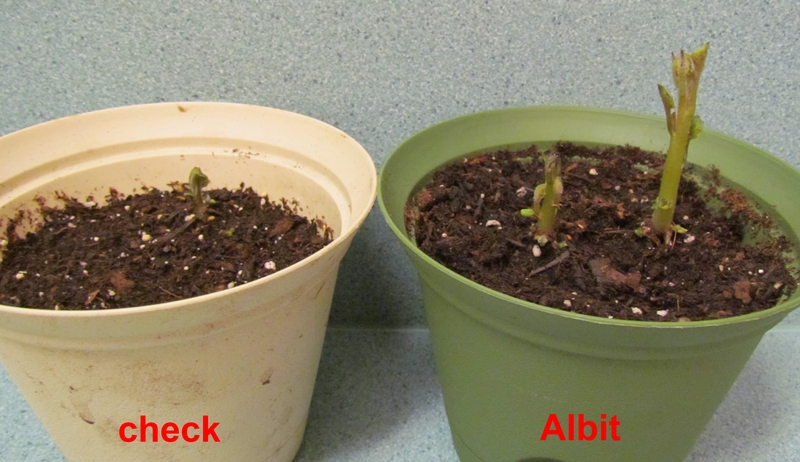 Plants treated with Albit had a faster growth of the above-ground biomass during early vegetative stage, which allowed plants to have higher yield. Yield of potato in Albit group increased by 4.4 t/ha (12.2%) as compared to the control yield of 36.2 t/ha. Chemical standard group had a smaller increase of 8.6%. 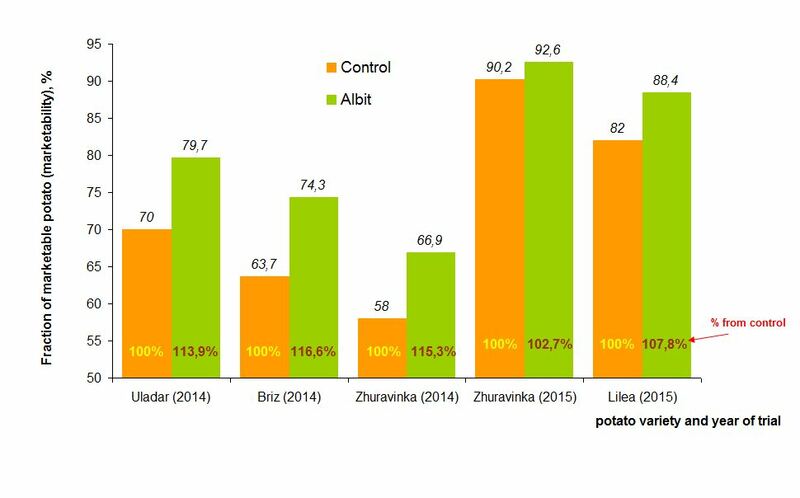 Albit had visibly improved the quality of yield and marketability of potato tubers: from 84.8% of marketable tubers in control to 91.7% in Albit group. Albit did not affect the amount of potato beetle on plants. When Albit was used in combination with insecticide based on fipronil, the effectiveness of insecticide did not change. High humidity and rainfall promoted disease development of potato, especially late blight. Spread of late blight disease in control reached 79.4%, and the development of late blight was 28.7%. Biological efficiency of Albit against late blight disease was 53%, which was 30% less that in chemical standard group. However, efficiency of Albit against black scurf (58.8%) was higher than in chemical standard (53%). Biological efficiency of Albit and chemical standard against early blight disease was 58.7% and 69.7%, respectively. Stable yield increase and high disease resistance in Albit group brought a significant sales profit. With the initial price of 4 rubles per 1 kg of potato, the net profit of using Albit was 16214 RUB/ha. Profitability of Albit was 1170%, with 12.7-fold cover of expenditure. In chemical standard profitability was 184%, with 2.84-fold cover of expenditure due to lesser yield increase and high pricing of chemical-based products. In 2004 VNIIZR continued to study Albit on potato. Potatoes var. Nevsky were planted on the experimental field of VNIIZR in Voronezh oblast on the 6th of May, with a standard quantity of 3 t/ha (three potatoes per one running meter). First sprouts showed on May 28, 2004. Chosen field was comprised of leached mid-loam chernozem soil, with 4.6% humus and pH 6.1. Previously the field was covered with annual grass crops. Soil was ploughed up to 25-27 cm, harrowed in early spring, and cultivated prior to planting of the crops. No fertilizers were added to the soil. Plants were distributed randomly on 25 m2 plots; experiment was replicated four times. During vegetative stage, plants were weeded and mould up twice. The observations of harmful impacts were taken on July 19, 2004; July 30, 2004; August 10, 2004; August 24, 2004; August 31, 2004. Insecticide containing thiamethoxam (0.2 L/t) + Albit 0.1 kg/t + two Albit sprays at the vegetative stage (0.05 kg/ha). Treatment was applied to potato tubers directly before planting; treatment at vegetative stage was applied at budding and flowering stages. Tuber treatments – May 06, 2004, foliar spraying – July 19 and July 30, 2004. Spread of black scurf and common scab in control was relatively low (2.8% and 5.5%); presence of early and late blight diseases was higher (22.5% and 45.8%). Albit decreased the development of black scurf both in Albit group and Albit + insecticide group (a.i. thiamethoxam). Biological efficiency of Albit against black scurf was 67%, while efficiency of biological standard was 33%, and efficiency of chemical standard was 50%. Even in conditions of high development of late blight disease biological efficiency of Albit (and Albit + insecticide) was 54.2-54.8%, which was higher than in variant with biological standard (44.1%) and lower than in variant with product containing oxadixyl + metiram. Chemical standard against late blight disease had the biological efficiency of 77.1%. Biological efficiency on early blight disease and common scab was 25.9% and 26% in biological standard group, 38.6% and 39% in chemical standard group, 30.8% and 30% in Albit group. Protective period of Albit against disease spread lasted for 15-20 days after treatment. Economic efficiency of Albit was higher than of the product containing Pseudomonas fluorescens and slightly lower than of the chemical standard. Yield increase in Albit group, as compared to control, was 2.46 t/ha (26.3%). Yield increase in biological standard group was 1.87 t/ha, or 20%, and in chemical standard group – 2.91 t/ha or 31.1%. Marketability of potato tubers in Albit group increased as compared to control, and was compatible to the marketability of potato treated with chemical and biological standards. Amount of productive stems in Albit group increased as well, and was on average 0.7 stems per plant higher (up to 3.68 stems) than in control plants. When Albit was used together with the product based on thiamethoxam (insecticide against Colorado potato beetle), Albit did no affect the effectiveness of the product. Albit increased the protective effect of the insecticide by stimulating stress resistance in plants, allowing the insecticide to perform more effectively. Yield increase in the insecticide group was 10.6% (due to protection of the yield against potato beetle). Yield increase in Albit + insecticide group was 18.5%. The net profit from using Albit was 7779.44 rubles per hectare – higher, than from using standards. The profitability of yield in Albit group was 246%, which was 2.4 times more cost-efficient than in the chemical standard group. The net profit from using biological standard was 6685.18 rubles per hectare. Another experiment was conducted in 2003 by experimental greenhouse centre “Meristematic cultures” (“Meristemny’e Kul’tury” Ltd) in Stavropol kraj. The goal of the field trial was to explore the efficiency of various products against black scurf and common scab on potato. Black scurf occurred in the control group with a frequency of 11.4%, and common scab – with a frequency of 17.5%. Each group was comprised of 30 tonnes of potato treated with various products and planted across 10 hectares. 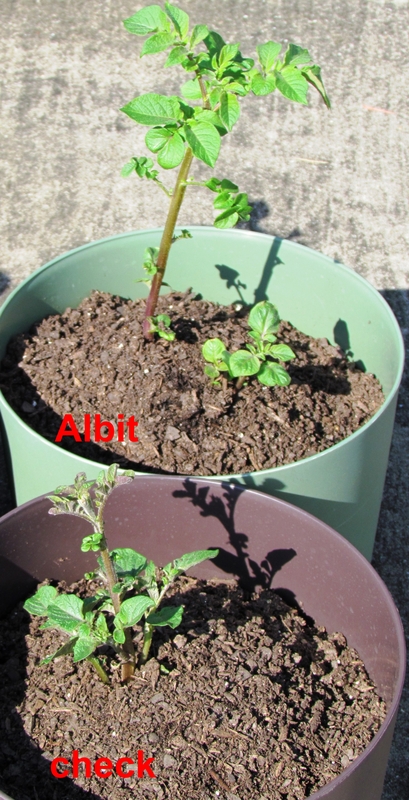 Albit groups had additional one-fold treatment with Albit (40 mL/ha at early vegetative stages). The results showed that in all variants had significantly decreased the disease damage of potato tubers. Chemical products containing thiram and thiabendazole (and the mixture of these products in particular) demonstrated the highest fungicidal effect against black scurf (75-80%) and common scab (79-82%). However, plants treated with these products had a delayed germination and slow plant development (first shoots appeared on the 15-24th day), as compared to Albit (first shoots appeared on the 12th day). Efficiency of Albit against black scurf was 58%; against common scab – 69%. Mixture of Albit and half-dose of product containing thiram had the efficiency of 65% against black scurf and 79% against common scab, which was higher than the efficiency of full dosage of product containing thiram without Albit (63% and 70%, respectively). Potato yield on average was 21.7 t/ha in control group. The most effective chemical treatments (groups 2, 3, and 4) decreased yield by 1.9-2.6 t/ha. Yield decrease was likely occured due to high stress that products with thiabendazole and thiram caused to plants. Other varieties of treatments increased yield, as compared to control group. Additional yield in group 1 was 1.3 t/ha; in group 5 (Albit + half-dose of thiram) – 1.7 t/ha. Group 6 (Albit) had the additional yield of 1.9 t/ha (9%) as compared to control, and 0.6-4.5 t/ha as compared to chemical products. Therefore, Albit group had the most promising long-term results on many observed parameters. This group had the earliest germination, fast growth and development of biomass, high-capacity healthy plants, and high yield; this group was also well-protected against diseases. Standard rate for 30 t/ha tubers. Tuber treatment and two sprays with Albit during vegetative stage, 100 mL/t + 2 x 50 mL/ha. The research considered the following plant diseases: late blight disease, common scab, black scurf. Epiphytotics of diseases were not observed. Spread of late blight disease and common scab was quite low (0.5-3% damage in control). Spread of black scurf was higher with damage of 18-22%. Damage of tubers with common scab in 2001 was relatively higher; and in 2002 late blight disease was not present. Yield was significantly less damaged (in 2-3 times) when plant defense products were used. Chemical standard treatment and triple Albit treatment showed the highest resistance against potato diseases. Single treatment of potato tubers with Albit single-handedly increased stress resistance and effectively immunized plants against diseases (50-60% of biological efficiency). Additional treatments during vegetative stage increased the positive effect by one third (Table 1.). Table 1. Influence of plant protection system on infestation of early potato var. Pushkinets’ by diseases (BSAU instructional farm “Milovskoe”, 2001-2003). Chemical standard treatment was effective against late blight disease (58.6-66.7%) and common scab (66.7-70.4%), with similar results in groups with biological products. Efficiency of chemical standard against black scurf was 32.1-40.3%. Tested products were the most effective against late blight disease and common scab at level one of applying fertilizers, and the most effective against black scurf at level zero without applying of fertilizers. Product containing Pseudomonas fluorescens had no effect against common scab and late blight disease, and had an effect of 50-54% against black scurf. Use of the product containing Pseudomonas fluorescens promoted plant defense, but such effect was short-termed (around a week). In the following days the development and spread of diseases increased and exceeded disease development in control. Therefore, it is required to use product containing Pseudomonas fluorescens every seven days after the first foliar spraying (over five treatments during full vegetative period). However, such approach is not cost-effective on potato of early variety. With the exception of the product containing P. fluorescens, all treatments used to suppress the spread of potato diseases increased potato yield (Table 2). The yield of the control group was 10.9-21.6 t/ha, depending on dosage of fertilizer. Chemical standard had an additional yield of 13.2-15.6%. Using Albit and a product containing P. aureofaciens significantly increased yield (in 1.5-4 times). Such increase was due to additional treatments during vegetative stage. Treating potato tubers with Albit added 12.1-23.9% (16.5% on average) to yield, as compared to control. Treating potato tubers with Albit + supplemental treatments during vegetative stage added 19-37.6% (25.7% on average). In the same way, treating tubers with P. aureofaciens added 5.7% to yield, and complex treatment added 18.6%. Using product with P. fluorescens on tubers decreased yield by 2.7%; the result of complex treatment by the same product was similar to the control’s. Table 2. Crop capacity and quantity of tubers of potatoes var. Pushkinets’ (t/ha) (BSAU instructional farm “Milovskoe”, 2001-2003). Analysis of yield data helped to determine the influence of both factors on yield maturation. With the favorable conditions of 2001, the impact of plant protection system on potato diseases was low: 8.5%. In 2002, when conditions were less favourable, the defense system was more effective: 18.7%. Using fertilizers had the highest impact on yield in both years: 90.6% in 2001 and 79.7% in 2002. Using of fertilizer, Albit and a product containing P. aureofaciens increased the amount of dry matter, starch (by 0.4-0.6%), and ascorbic acid (by 1.1-2.3 mg %) in potato tubers (Table 2). Chemical standard and product with P. aureofaciens had a similar effect, and in varieties with P. fluorescens lower amount of these components were observed. All products with biological defense had a decreased amount of nitrates in yield. Biochemical reactions of immunization form the foundation of Albit’s protective effect on potato. Therefore, the research examined morphological and biochemical changes in potato cells that led to reinforcement of the defense system after Albit treatment. Cytological studies found that Albit has various effects on potato cells. After Albit treatment the amount of lamellae on the inner side of the cell wall increases in 2-6 times. Simultaneously, the amount of mitochondria in the protoplast increases. Endoplasmic reticulum falls into cistern-like fragments with multiple vacuoles. Polymorphic anaplasts form around the nucleus in sensibilized tissues. Anaplasts have an electron-dense stroma, are deprived of starch and have a high amount of proteins. Agranular endaplasmic reticulum forms in the peripheral part of cytoplasm in order to synthesize carotinoids, terpenoids and phenylic acids. As a result, potato cells are capable of powerful resistance against infections. Tuber treatment before planting with a product containing carboxin + thiram; treatment at budding stage, and ten days later with a product containing famoxadone + cymoxanil. Standard rate for 30 t/ha. Dosages of all products were applied as recommended. Using stability inductors and calculating doses of fertilizers significantly increased the germination capacity (up to 93-99.5%) and the amount of sprouted buds in the eyelets as compared to the control group. Groups treated with Albit and a product containing triterpenic acids showed the highest results in leaf mass, assimilating surface area, the amount of stems (both from one plant and from a land unit), and the amount and weight of tubers (especially during the flowering stage + 20 days). Using the product containing Pseudomonas fluorescens decreased the indices of these characteristics as compared to control. The results of the group with the product containing Bacillus subtilis was not significantly different from control measurements. Using Albit and the product containing triterpenic acids increased the amount of chlorophyll and carotinoids in potato leaves during all periods of measurements. Plant leaves had bright coloring until harvesting. The amount of ascorbic acid in leaves increased as well (by 6-40%), which stimulated higher stress-resistance of plants. Using bio-products significantly increased yield of early varieties of potato. Increased the quality of potato tubers was observed, when using of defense reaction activators with calculating fertilizer doses as background. The highest crop capacity of potato yield was observed in 2004: 18.5-22.3 t/ha (in 2005: 16.60-18.09 t/ha). Use of bio-regulators increased the crop capacity by 1.13-3.88 t/ha. In 2004-2005 maximum crop capacity was obtained while using Albit: 30.5 t/ha. Study showed that applying of bio-regulators in combination with different fertilizer dosages also changes the quality of early potato varieties. The amount of starch in wet weight was around 17.72-18.60%. Albit increased the amount of starch by 0.64% (with control group’s starch content of 18.10%). The amount of dry matter was within 25.30-26.84%. Albit increased the amount of dry matter by 0.90% (with control group’s dry matter of 25.94%). Mineral fertilizers decreased the amount of starch by 0.29-1.06%. The amount of vitamin C was within 22.10-23.32%. Albit increased it by 0.74% (with control group’s vitamin C content of 22.58%); mineral fertilizers decreased vitamin C content by 0.31-0.52%. Marketability of potato tubers was 91.2-95.3%; with Albit, marketability increased by 2.7%. Biological efficiency of Albit on stems during the years of the experiment was 54% against Macrosporium leaf spot, 42% against late blight disease (Table 3), 78.9-99.8% against late blight disease (Table 4). Biological efficiency of Albit against common scab on tubers was 48%. The protective effect of Albit was the highest amongst all applied products. Table 3. Spread of late blight disease and level of its development on tops of early potato during treatment with various chemical and biological products (BSAU instructional farm “Milovskoe”, 2004-2005). Table 4. Biological efficiency of fungicides against late blight disease on potato tubers var. Nevsky (BSAU instructional farm “Milovskoe”, 2004-2005). Data collected on the harvest day. Apart from the defense against diseases, Albit increases drought tolerance and efficacy of moisture absorption by plants. With Albit, resistance to temperature stress, as well as to water deficiency, increases by 10-60%. Molecular mechanisms that increase drought tolerance after systematic Albit treatments are currently being studied. When Albit immunizes plants, it induces certain mechanisms responsible for sensitization of plants against osmotic and temperature stress during soil and air drought. Studies shown that the processes of phyto-immunity are highly correlated with phyto-regulator activity. Therefore, Albit may influence on regulating of auxin activity. Increased contents of chlorophylls and carotenoids (basic photosynthetic pigments), enhanced intensity of photosynthesis and enhanced synthesis of antioxidant in cells can also stimulate plant drought tolerance. These processes increase post-stress recovery rates. Increased content of ascorbic acid in potato leaf cells is an important mechanism of drought tolerance. Albit increases the contents of ascorbic acid from 6 to 40%. Ascorbic acid (vitamin C) in plants is a quenching agent of free radicals and reactive oxygen species. Increased concentrations of ascorbic acid can promote stress resistance. Considered above mechanisms highly improved the positive effect of overhead irrigation in groups treated with Albit + fertilizers “Kemira”. Cost efficiency of using various bio-regulators in combination with mineral fertilizers on early varieties of potato was different in two years of the conducted study. Albit in combination with standard rates of manure and mineral fertilizers brought the maximum net profit 48952 RUB/ha and 180.4%, respectively. Standard rate for 30 t/ha. Complex fertilizer “Kemira-universal” was used during field trial. Similarly to the past field trials, use of stability inductors and fertilizers considerably increased field germination up to 96-99.8%. The amount of sprouted buds in the eyelets increased as well over control, particularly in the group treated with product containing Pseudomonas fluorescens. Variants with Albit and product containing triterpenic acids showed the highest results in leaf mass, assimilating surface area, the amount of stems (both from one plant and from a land unit), and the amount and weight of tubers (especially during the flowering stage + 20 days). Organo-mineral fertiliser was applied into soil before field trials with these two variants. Using the product containing Pseudomonas fluorescens decreased the indices of these characteristics as compared to control. The results of the group with the product containing Bacillus subtilis was not significantly different from control measurements. Using Albit in combination with fertilizers on early potato varieties significantly increased the crop yield. In comparison with control, Albit group had 1.3 t/ha additional yield without added fertilizers. With added “Kemira-universal” fertilizers, the additional yield was 4.6 and 5.2 t/ha (Table 5). Table 5. The effect of different products on the crop capacity of potatoes var. Nevsky, t/ha (BSAU instructional farm “Milovskoe”, 2006-2007). The quality of potato tubers was noted after application of promoters of defense reactions in plant. Our studies shown that bio-regulators and different dosages of fertilizers affect the quality of yield. Albit increased the starch content by 0.2% (with starch content in control being 17.8%). Application of mineral fertilizers decreased starch contents by 0.15-0.25%. Albit also increased the dry matter content by 0.3% (with 25.6% in control); fertilizers decreased the content of dry matter by 0.29-0.86%. Albit increased the ascorbic acid content by 1 mg % (with 21.4 mg % in control); mineral fertilizers decreased ascorbic acid content by 0.31-0.32% with increasing doses of mineral fertilizers. Biological efficiency of Albit in 2006-2007 against late blight disease was 20.5-42.1%. Biological efficiency against Macrosporium leaf spot was 59.8-69.8%. Biological efficiency against common scab was notably high: 53.7-69.6% (Table 6). Profitability analysis showed that tonne of yield collected from the Albit-treated group was the most cost-efficient vs. applied fungicides of 4th generation and fertilizers of 3d generation. The profitability of potato treated with Albit was 304.1%, which was higher than in all other groups (Table 7). Table 7. Cost-efficiency of using various products on potatoes var. Nevsky, with standard rate of fertilizers on 30 t/ha of tubers (BSAU, instructional farm “Milovskoe”, 2005-2006). Multifactorial field experiments tested different types of irrigation. Overhead and drip irrigations were effective on early varieties of potato. In group treated with Albit (fertilizer “Kemira” was applied into soil before field trial) trickle irrigation was particularly effective (by 50%). Therefore, field trials conducted by BSAU demonstrated the positive effect of Albit on potato yield. Albit was proven to be biologically effective against late blight disease, common scab and Macrosporium leaf spot of tubers (Fig. 7). Seven years of experiments in the Republic of Bashkortostan collected important biological data on the effect of different products on potato, grown in leached chernozem loam. 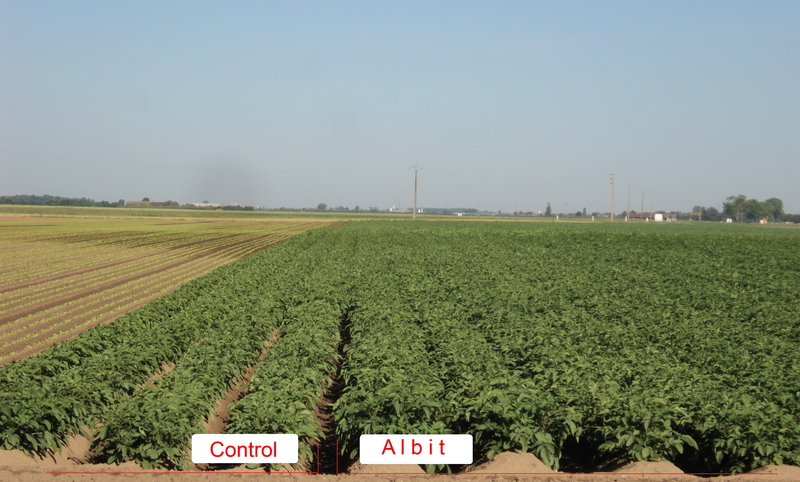 Albit, tested as a bio-fungicide, had a positive effect on potato both on dry and irrigated land. The experiments proved the remarkably high biological and agronomical efficiency and profitability of Albit. The results of multiple trials and continuous practical use of Albit in Russia and around the world prove that Albit is an effective complex product that is guaranteed to increase crop capacity and stress resistance in potato.